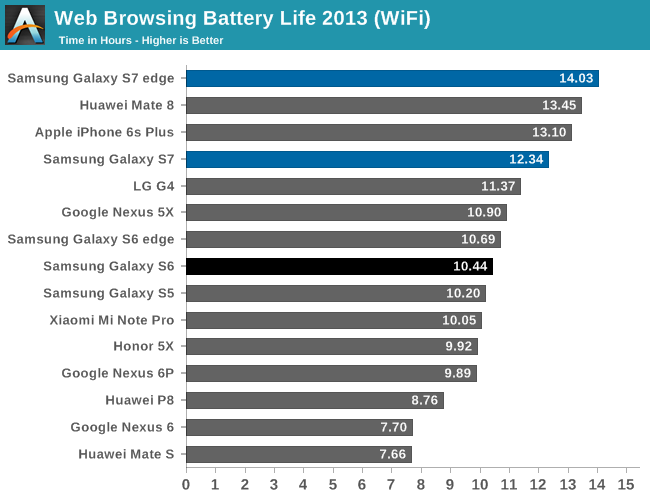 Battery life remains one of the most important aspects of any mobile device. After all, you can’t really call something mobile if it has to spend most of its time connected to an AC adapter. As a result, battery life testing is one of the most critical aspects of our testing, and it’s something that we spend quite a lot of time discussing internally. Before diving into our results, I want to start things off talking about testing methodologies. 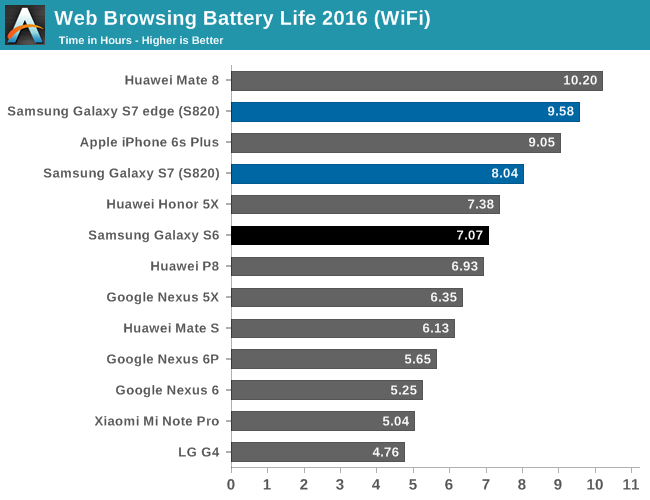 This year we're implementing an overhaul of our web browsing test for battery life, with the Galaxy S7 review being our first chance to deploy it. As far as our long-standing 2013 test goes, at a high level our 2013 test was relatively simple in the sense that it simply loaded a web page, then started a timer to wait a certain period of time before loading the next page. And after nearly 3 years it was time for it to evolve. Internally, we’ve been discussing reasonable measures to push our web browsing test in new directions to both better represent real-world workloads in addition to ensuring that we’re testing more than just display power. For at least a few devices, it had already become quite evident that our old test was almost purely display-bound to such an extent that even video playback was more power intensive. Other issues that were raised both internally and externally included the fact that the test would not test aspects like CPU governor boosts upon touching the display, and that our test almost entirely ignored things like 2D drawing and display pipeline efficiency. In recognition of these issues, we’ve spent the past few months working on a new test. In addition to new webpages that are exact copies of many popular websites today to better represent modern, real-world workloads, we’ve added a major scrolling component to this battery life test. The use of scrolling should add an extra element of GPU compositing, in addition to providing a CPU workload that is not purely race to sleep from a UI perspective. Unfortunately, while it would be quite interesting to also test the power impact of touch-based CPU boost, due to issues with reproducing such a test reliably we’ve elected to avoid doing such things. However, we don’t take these changes lightly. While we’ve validated the workload for several devices, it’s important to emphasize that these results could change in the future as much of this data is preliminary. For the second part of the review I’ll be sure to revisit these results with an expanded dataset. Of course, other than the workload the device setup has been held constant across these tests by equalizing brightness to 200 nits and disabling all background sync to the best of my ability. As we can see in the results, the Galaxy S7 and S7 edge both do impressively well. One of the more interesting comparison points here would be against the latest devices like the Huawei Mate 8, which has the Kirin 950. Our previous test was relatively display-bound so differences in SoC efficiency were often difficult to discern and often masked entirely, but here we can see an enormous spread that is almost entirely due to SoC efficiency. The Huawei Mate 8, which under our previous test seemed to be only slightly above the iPhone 6s Plus, has gained a noticeable lead in this test as the Kirin 950’s CPU efficiency is ahead the competition at this time, although it’s important to keep in mind that CPU efficiency is not the only relevant metric for an SoC. Interestingly enough, the Galaxy S7’s battery life is almost directly scaling with battery size relative to the Galaxy S6. As we’ll see in the display section, the Galaxy S7’s display is pretty much identical to the Galaxy Note5 and S6, so it looks like the efficiency gains from the Galaxy S6 to the S7 are small if you look at the Snapdragon 820 variant. Of course, the big question that I’m sure a lot of people are thinking is how the Galaxy S7 and the Snapdragon 820 compare to the iPhone 6s and 6s Plus. Unfortunately, due to timing constraints we weren’t able to get data for the smaller iPhone 6s, but looking at the iPhone 6s Plus relative to the Galaxy S7 edge it’s pretty obvious that there is a power efficiency gap between the two in this test. Despite the enormous difference in battery size - the Galaxy S7 edge has a battery that is 33% larger than the iPhone 6s Plus - the difference in battery life between the iPhone and Galaxy in this test is small, on the order of half an hour or 5-6%. This is balanced against a higher resolution (but AMOLED) display, which means we're looking at SoC efficiency compounded with a difference in display power. In the interest of providing another data point and some validation of our testing results, I ran both devices through our old web browsing test to see what the results would be for something that should be display-bound. Here, it’s obvious that the Galaxy S7 edge holds a significant lead over the iPhone 6s Plus, although the use of a higher resolution display and an AMOLED display in a high-APL test means that the GS7e is using more power in this test as well. However, when you take these results with our new web browsing test, it becomes evident that a difference in power efficiency is growing as the load on the SoC grows. Similarly, despite the Galaxy S7 being neck and neck with the Huawei Mate 8 in our older test, it loses the lead in our new web browsing test. Of course, I have caution that all of the data that we’re gathering for the web browsing test is still subject to change, but given the interesting data that it provides it’s important for us to include these results, as we’re reasonably confident that these results are accurate. Overall though, it’s clear that the Galaxy S7 and S7 edge will have solid battery life, even if device efficiency isn’t quite on par with the very best that we’ve seen so far. An improvement of 15% is going to be noticeable if you upgrade from the Galaxy S6, and anyone upgrading from a phone with an SoC older than the Snapdragon 800/801 generation will see huge improvements here. Do you mean Apple vs adreno or PVR vs adreno? I'd expect PVR to always be the most efficient GPU due to being a true tbdr. You forgot the user experience. Throwing 30 fps onscreen is the minimum requirement, no need higher than that, unless Apple follows the resolution war. Looks like Qualcomm spent their time creating a quality core instead of just adding more cores. Half the cores of the 8890 and by all accounts at least as fast (CPU, not GPU where it's quicker).